The importance of evidence-based policy making, why measurement matters, and Claire Dunlop on learning from failure. 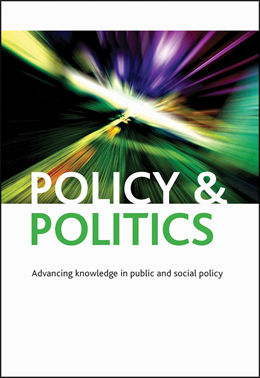 Free research articles for APPAM 2017 from Policy & Politics on the importance of evidence-based policy making, why measurement matters and, Claire Dunlop on learning from failure. In celebration of APPAM’s Fall Research Conference theme this year which looks at the importance of measurement in evaluating policy and performance, we have developed a virtual issue of recent research articles based on the conference theme which are free to access from 1-30 November. Just click on the hyperlinks below to go straight to the download page for each article.